Martha has become a popular speaker, especially among women’s groups. Her experiences as a divorced working mother of three in the 1960’s resonate with female audiences. Her honesty about the challenges she faced balancing home and work life, dating and the unequal treatment she faced in the workplace make her relatable and her story very inspiring. Martha has given 33 book talks over the past two years. 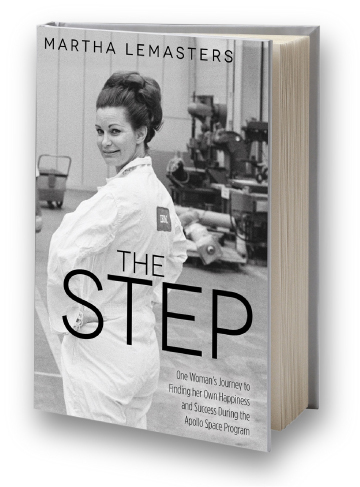 She has been tireless in her efforts to promote The Step. She is currently taking a well-deserved break from her book tour. For more information please contact bethany@nestmediaco.com or call 772.766.4926. Tuesday, April 2, 2019, 11:30 a.m.
Friday, April 26, 2019, 1 p.m.
Wednesday, April 6, 2016, 4 p.m.
Friday, April 8, 2016, 7 p.m.
Saturday, April 9, 2016, 7 p.m.
10500 West Forest Hill Blvd. Saturday, April 16, 2016, 11 a.m.
Saturday, April 16, 2016, 3 p.m.
Friday, May 6, 2016, 6 p.m.
Saturday, May 7, 2016, 1 p.m.
Saturday, May 7, 2016, 3 p.m.
Friday, May 13, 2016, 2 p.m.
Saturday, May 14, 2016, 2 p.m.
Sunday, May 15, 2016, 2 p.m.
Saturday, May 21, 2016, 2 p.m.
Sunday, May 22, 2016, 3 p.m.
Saturday, June 11, 2016, 4 p.m.
Friday, August 5, 2016, 3 p.m.
Wednesday, October 19, 2016, 12 p.m.
Wednesday, October 19, 2016, 2 p.m.
Wednesday, October 19, 2016, 7 p.m.
Saturday, January 7, 2017, 2 p.m.
Monday, January 9, 2017, 11:30 a.m.
Saturday, March 11, 2017, 11 a.m. -3 p.m.
Wednesday, May 10, 2017, 11 a.m.
Saturday, July 8, 2017, 10:30 a.m.
Wednesday, October 4, 2017, 7 p.m.
Saturday, December 9, 2017, 11:30 a.m.
Saturday, January 20, 2018, 11 a.m.
March 21, 2018 at 11 a.m.
April 12, 2018, at 7 p.m.